This new targeted fund is to support Bruce Grey wide welcoming initiatives for newcomers both to the community and those new to Canada. Bruce and Grey Counties are expecting a significant influx of newcomers to our community and we need to ensure the resources and community agencies are able to support these new residents. 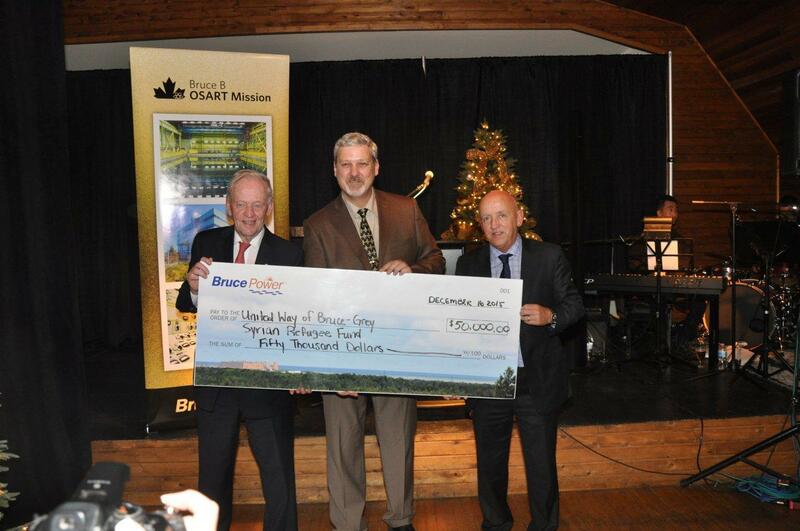 December 17, 2015 – Bruce Power and the United Way of Bruce-Grey are teaming up to create a fund to support the expected influx of Syrian refugees and other newcomers to the region. Bruce Power will donate $50,000 to kick-start the fund and the United Way of Bruce-Grey will administer it and is contributing $10,000 of in-kind support to the initiative. Bruce and Grey Counties are expecting a significant influx of newcomers according to Francesca Dobbyn, Executive Director of the United Way of Bruce-Grey. Millions of Syrians have been displaced due to conflict in their home country and the Government of Canada is working with Canadians, including private sponsors, non-governmental organizations, provincial, territorial and municipal governments to welcome 25,000 Syrian refugees. Approximately 1,000 refugees have arrived in the country since early November. which Canada has a responsibility to act on as quickly as possible. playing a role in supporting their resettlement. free of conflict. It’s the right thing to do, and the least we can do as a country. to our economy, started businesses and created new jobs. meet the incredible need that exists. This fund is not to support the sponsorship of and the direct efforts of supporting refugees, it is to support the work of the various community committees who are doing the front line support of newcomers and refugees. A 15% administrative recovery policy is applied to all funds raised, including face value of gift cards. This helps cover costs associated with United Way resources: staff, meeting space, mileage, bookkeeping etc. All funds exceeding established activities will be held for anti-discrimination and welcoming activities throughout the two counties.